So you couldn't get enough of Wimbledon? It's no wonder punters love to make a ''racket'' about this exciting, enticing game. I have a penchant for women's tennis and our pro tennis trader knows his stuff. I'm sure the Australian Wimbledon winner of 1987 must have been having a bad hair day to detail such thoughts. Considering the Williams' sisters would most likely have played him off the court he may have uttered this volley of words in favour of Slazenger balls. Tennis is one of those sports which is open to some very strange happenings which makes the highs and lows of betting all the more exciting. I guess you have heard about Jimmy Jump? Well, he is infamous for causing trouble at sporting events. The Spanish streaker from Sabadell, Catalonia has caused a string of incidences. Just about every sport has been a victim of his antics: Football, Formula One, Basketball, Rugby, Water Polo, Eurovision Song Contest & Goya Awards. In fact, he's even appeared in a weather forecast on Hungarian TV. Tennis hasn't escaped his attention. 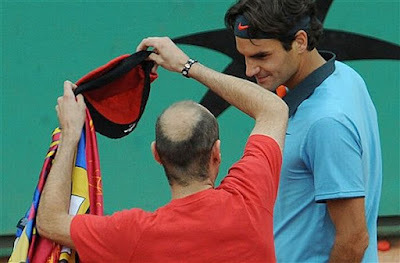 During the 2009 Men's Singles Finals of the French Open, he grappled with Roger Federer, attempting to place a red barretina on his head. A traditional hat that is frequently worn by men in parts of the Christian cultures of the Mediterranean sea such as Catalonia. Jimmy The Jump was tackled by a security guard after he jumped the net. I don't know about you, but I've noticed some women grunt a lot when playing tennis. I hate to say it, but I've pressed mute a good few times over Wimbledon. Do you find it distracting or obnoxious over a certain number of decibels? Did you know that Monica Seles is considered the creator of the grunt? An honour that went with her Wimbledon title in 1992. In recent years, many have called for grunting to be banned or punished. Certainly, Ivan Lendl would have loved to have put a sock in the mouth of Andre Agassi in their 1988 US Open. Lendl said: ''Every time he went for a big shot, his grunting got much louder. Do you think it is a form of cheating?